Toxic smokestack emissions aren’t the only public health threat from industrial scale biomass energy facilities. Fires and explosions have been responsible for multiple injuries and three deaths at biomass incinerators over the past three decades. As of May 2013, fires and/or explosions have occurred at 20 industrial biomass incinerators, based on research from UK-based Port Talbot Residents Against Power Stations andThe Biomass Monitor. Additionally, over 45 wood pellet plants and 20 wood products mills have experienced fires of varying levels of intensity and destructiveness. Fires at biomass facilities typically start from boiler fires, spontaneous combustion of fermenting woodchip or sawdust piles, or wood dust explosions, according to the Institution of Fire Engineers. On April 25, 2013, the Koda Energy combined-heat-and-power biomass facility in Shakopee, Minnesota exploded, igniting a fire in two of its fuel storage silos that burned for over a week. The 23.4 megawatt facility burns wood chips, oat hulls and other organic materials to generate electricity for Xcel Energy Inc. The cause of the fire has not been determined and it’s uncertain when the facility will start up again. A 600 megawatt coal/biomass facility in Nijmegen, Netherlands exploded on November 8, 2012 due to “steam pipe overpressure,” according to owners GDF Suez. Police told residents to stay inside as steam clouds billowed into the air and ceramic wool littered the streets. A sawdust pile at the 30-megawatt Biomass One incinerator in White Pine, Oregon burst into flames on September 15, 2012 and again on September 18. A woodchip pile had previously caught fire at the facility on July 4, 2009, likely due to spontaneous combustion, which occurs as woody material decays and heats up. Dong Energy’s 810 megawatt biomass power incinerator in Avedore, Denmark experienced a fire on August 12, 2012 that began in its electrical conveyor system and spread to its wood pellet silos. The cause of the fire is unknown. Three people were injured, including one person suffering severe burns, after a May 11, 2012 wood dust explosion in a wood pellet silo at the Amager Power Station in Copenhagen, Denmark, which burns biomass and coal. The fire was traced to a cleaning method called “bang and clean” which uses small explosions of oxygen and methane to clean boilers, but was used in this case to unblock a plug of wood pellets. Fire returned to the facility again on December 19, 2012. 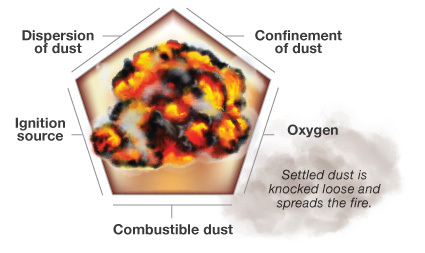 Dust explosions throughout industry—not just the biomass industry—are so common, there’s an entire website devoted specifically to keeping track of them. Occupational Safety and Health Administration (OSHA) calls dust fires a “major industrial hazard.”An October 2009 report notes 280 dust fires and explosions at industrial sites—the largest percentage being wood, but also including “food products, metal products, chemicals, pharmaceuticals, rubber and plastic products, paper products, furniture, electric and sanitary services, transportation equipment, durable goods, and textile mills”—over the past 25 years, which have killed 119 people and injured 700. OSHA conducted 1,000 inspections, with 25% of inspections of wood related facilities and found 3,786 federal (74% serious) violations and 1,140 state (34% serious). A pipe explosion blew a hole in the boiler and a six foot hole in a concrete wall at the Blue Lake Power biomass incinerator in Blue Lake, California in March 2012. The facility’s wood-loading conveyer belt caught fire the year before. A massive fire raged inside wood pellet silos for RWE’s Tilbury Power Station in Essex, UK, on February 27, 2012. The biomass incinerator—the largest in the world at 750 megawatts—had just been converted from coal to woody biomass a month earlier. RWE claims no single cause can be attributed to the fire, but suspects that smoldering wood pellets triggered the dust fire. Two workers were critically burned at an explosion at Nacogdoches Generating Facility in Sacul, Texas on January 31, 2012. The fire was blamed on an electrical explosion, though the exact cause has not been determined. At 100 megawatts, Nacogdoches is the biggest biomass power incinerator in the US and is now owned by Southern Power, a subsidiary ofSouthern Company. Due to low demand for its power, the facility has been sitting idle the majority of the time since 2012. A “huge” fire ripped through a storage facility for wood pellets at Port of Tyne, UK on October 31, 2011, the pellets destined for the Drax biomass power incinerator in Yorkshire. The fire, which took firefighters twelve hours to extinguish, is thought to have been caused by spontaneous combustion following a “chemical reaction” inside the storage unit. The baghouse filter system for Middlebury College’s combined heat and power facility in Middlebury, Vermont caught fire on May 16, 2011. “Friction” in a wood pellet crushing machine started a three alarm fire on March 1, 2011 that set several floors on fire at Schiller Station, a 50 megawatt biomass power incinerator in Portsmouth, New Hampshire. In February 2007, an “obstructed pipe filled with burning ash” also caused a fire and in 2006 four firefighters suffered first or second degree steam burns from fighting a fire in an ash containment facility on the premises. Three workers aged 29, 59, and 62, were tragically killed when a biomass energy facility exploded at Brilon Chipboard Plant in North Rhine-Westfalia, Germany on February 5, 2010. The cause of the deadly explosion at one of Europe’s largest chipboard manufacturing facilities is unknown. A stack of discarded dock piers caught fire while being chipped for the Piney Power Plant in Clarion, Pennsylvania on July 15, 2009. Two firefighters suffered heat exhaustion while battling the blaze. A feed hopper at the University of South Carolina’s biomass power incinerator exploded on June 28, 2009 in a “potentially lethal accident” which propelled a metal panel 60 feet towards a control office, reportedly from a fuel augur rupturing. The $20 million facility, which was built in 2007, was shuttered in 2011 after having been shut down over three dozen times and experiencing three accidents. A biomass incinerator in Sittard, Netherlands was “virtually completely destroyed” by a fire that followed an explosion on May 10, 2007. The cause of the explosion is unknown. Fires in a smoldering fuel pile at the Boralex construction and demolition debris incinerator in Athens, Maine in 2002 caused the Maine Department of Environmental Protection to fine the corporation $600,000. The smoke sent several people to the hospital. Beaver Wood Energy’s biomass incinerator in Livermore Falls, Maine had a fuel pile catch fire lasting over a month in October 2006. The facility has a “ long history of air emissions violations” including High Priority Violation of the Clean Air Act since April 2005. A wood chip pile caught fire from “extreme fermentation” at the McNeil Generating Station in September 1985, a 50 megawatt biomass power incinerator in Burlington, Vermont. The facility is the state’s largest polluter and is within a few hundred feet of the most ethnically-diverse neighborhood in Vermont. Tighter safety regulations have been discussed to help prevent future tragedies at biomass incinerators and other facilities, yet industry has pushed back due to the added expenses. “The biomass industry likes to say how clean their facilities are because they’re not doing ‘uncontrolled’ burning,” said Ewall. “But the reality is, on top of inadequately controlled smokestack emissions, communities actually run the risk of being exposed to multiple incidents of uncontrolled burning” from routine incidents of fire.